For many of you school has started, and I really hope your child is having a great year. It’s scary sending your child off to a new year, especially if they’re going to a new school, a new class, or have a new teacher or aid. So many factors play into our children’s lives. 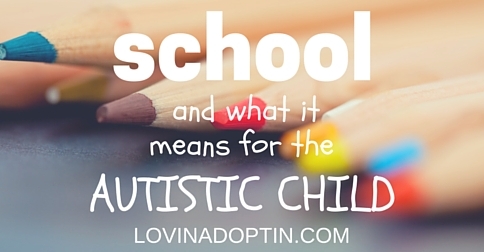 Think of all the changes a new school year brings for the autistic child. Oh my, it makes me cringe, literally. Like I wanted to keep Jeremiah at home all day every day, no school, just stay at home and BE. That was my promise if the school year didn’t start off well, I’d give it a week or so and then I’d fire my jet-packs and be outta there! If the new Special Ed teacher wasn’t kind, the doors would swing shut behind us. If he couldn’t handle how much they have to sit and do book-work in Kindergarten we’d say sayonara, and wave the white flag. So many factors. Ugh. Some parents of autistic children don’t quite understand what their child feels or how their child perceives their space. It’s common because not many autistic adults have their voice broadcast over the airwaves telling us about themselves. This is largely in part because we mostly hear the professionals voices sharing what they think they know about the autistic person. But who better to tell us what our child experiences than those who’ve been there and seen and felt it all? While going back to school can include some positives for kids on the spectrum, I went into every new year with an overwhelming amount of anxiety. Most of that stress was due to social fears, but there was another factor that was just as problematic and that I didn’t understand until many years later. That is: the sensory onslaught that a new school year represents. Today, I understand: being at home meant being somewhere so familiar that I had long since acclimated to its sensory peculiarities. The lighting, sounds, tactile variations…my mind was used to it all, and therefore didn’t have to work as hard to process the never-ending stream of incoming data. Familiar = peaceful. 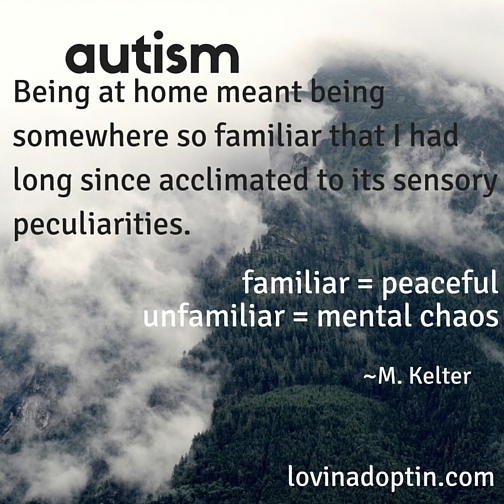 Unfamiliar = the polar opposite; it is mental chaos. And after spending a summer immersed in the peaceful sensory familiarity of home, school became that polar opposite. A new school year would mean…not just a different setting, but one that included a huge number of different rooms and activities. The classroom had one set of sensory experiences (sounds from pencil sharpeners, different voices, chair legs scraping floors, etc. )…the hallway had another set…the playground had its own range of sensory experiences, as did the lunchroom, the bathrooms and so on. It takes my mind quite awhile to acclimate to any new environment. And school was a dozen new environments, all rolled into one. At the time, I didn’t understand why I found simply being at school to be so overwhelming. Today when I go places, I immediately feel run down and I understand: my mind is just having to sort through a huge number of unfamiliar data points. The lights are different and this can be painful until I acclimate (which can take many months). The sounds are different, which can feel strange, disorienting…again, I need time to get used to that. If it’s unfamiliar and it filters through one of the five senses, it can take quite a bit of time to acclimate to that newness. For me, school was just layers and layers of confusing input that shifted throughout the day and intensified as we were shuttled from activity or room to another. It felt like being inside of a giant sensory kaleidoscope that spun too fast…that I had no control over…that never stopped turning. I mention it now, because at the time, I never had words for any of this. I just stressed and felt overloaded and I couldn’t understand what was happening. I’ve read a lot about autism, I’ve read and listened to autistic adult’s perspectives on autism, I’ve lived with autism, and I’ve written about autism, but there is still so much I’m learning. This is what our kids face, this is why there are meltdowns, chewing on their shirts or anything their teeth can reach, stimming, head banging, grinding of teeth. Oh, noise bothers me, lighting can irritate me, new environments stress me out, but this, this magnitude, I don’t know what I’d do. I hope this helps you understand and empathize with your child. I hope it encourages you to work with your teachers, special educators, principles, and aids to guide your child through this sensory onslaught. I am a supporter of inclusive environments for children with special needs, meaning they are part of the general classroom as much as possible. However, we need to be sensitive to their psyche, supporting them and offering alternatives when necessary.